This year we supported Damon Wakes unbound book 10 Little Astronauts. He is literally days away from completing his goal and we need ALL your help. Please tweet, share, instagram, post and buy gift cards to help him reach 100% funding. It’s the eleventh hour. Aragorn is making his “It is not this day” speech. The rebels are approaching the Death Star. Neville Longbottom has destroyed the final horcrux and Harry Potter is preparing to battle Lord Voldemort. I’m not familiar with Twilight, but I’m sure there’s some confrontation between Heartthrob McSparklepants and a bad guy of some kind. The point is, there are just days left to fund Ten Little Astronauts. At 63%, it’s the bulk of the way there and it has a solid chance of reaching its target, but only if the people who want that to happen make it happen. At this point, you’re either behind the book or you’re not: there’s no time left to “get around to it.” 213 people (at current count) have pledged for a copy of their own. Countless more have shared it, told their friends about it, and generally helped it along in less direct ways. If it’s not your kind of thing, I get it. If you can’t afford to chip in for a copy right now, I definitely get it. 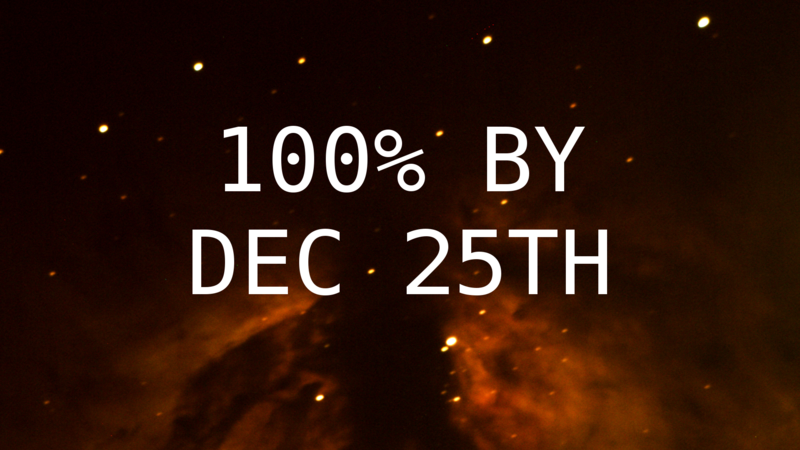 But if you’d like to help my career as an author all the same, doing something – anything – to spread the word about it before that Christmas deadline would make a spectacular difference to the book’s chances of success at absolutely no cost to you. Ten Little Astronauts is a sci-fi murder mystery novella based on Agatha Christie’s And Then There Were None. It takes the basic premise of that popular classic – ten people trapped together with the knowledge that one of them is a murderer – but shifts it into interstellar space. The book is being published by Unbound, who crowdfund all their titles. This means that readers pledge for – essentially pre-order – a copy, and potentially extra rewards if they choose to contribute more to the funding of the book. Those pledges are what cover the cost of designing, editing and printing the thing. Ten Little Astronauts already has enough support to make it into print – other books that were accepted onto less ambitious lists have funded with less than half the number of readers behind them – but if it reaches 100% of its goal by Christmas, the paperback will be of higher quality and it’ll be distributed by Penguin Random House. Obviously, this would be a massive boost and help ensure the book has the best possible chance of success once it’s printed and out there. A copy of Ten Little Astronauts (paperback and/or digital, depending on the reward level chosen). Their name in the back of every edition, recording them as one of the original supporters. Immediate access to exclusive bonus rewards, most of which you’ll find listed in this update. The option of becoming a test reader for Girth Loinhammer’s Most Exponential Adventure, the massively interactive fantasy parody I’ve been working on for the past two years. A place in a prize draw. When the book reaches 225 supporters, I’ll be sending a signed copy of Myths, Monsters, Mutations to one of those first 225 supporters at random. If we reach 250, I’ll most likely be doing much the same thing. A badge. 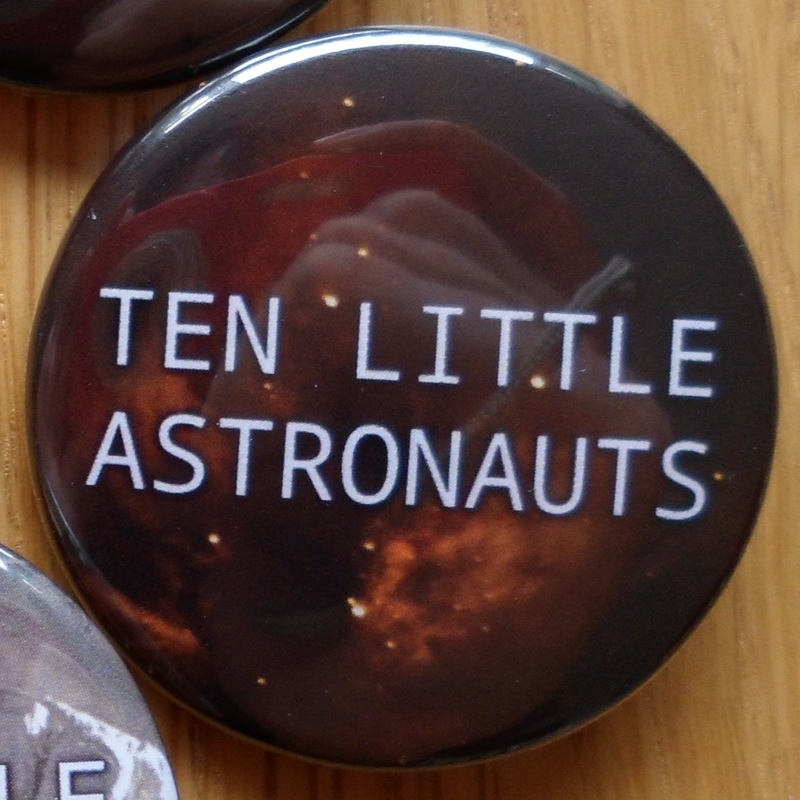 If Ten Little Astronauts reaches 100 Paperback pledges by the end of Monday 18th, I’ll be sending out a Ten Little Astronauts badge with every single paperback. We’re already (currently) at 83, so there’s a very good chance we’ll get to 100: the real question is whether enough people will share it around for that to happen before Monday. Over 200 people have taken Ten Little Astronauts well over halfway to its target. It’s up to you to help take it those last few steps. If it sounds like your kind of book and you’d like a copy for yourself, please put in a pledge to get one, and invite your friends to do the same. If it’s not your cup of tea and/or you can’t afford to pledge for yourself, please share this post. The audience for this book is out there: the only challenge is reaching them in time. 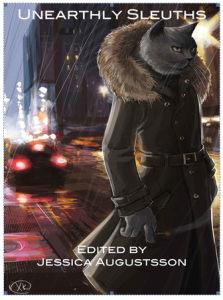 Unearthly Sleuths is an anthology of speculative detective fiction by JayHenge Publishing. It includes two stories by Damon himself—lighthearted steampunk “The Card” and the significantly more sinister “Noise on The Wire”—as well as many more by a wide variety of other authors. You’ll have to be quick if you want to be in with a chance of winning this book, though: 196 of those 200 places are already taken, meaning that there are just four still up for grabs! To put in a pledge for yourself, simply follow this link. As well as a chance of winning Unearthly Sleuths, you’ll get your very own copy of Ten Little Astronauts, have your name recorded in the back of every edition of the book. If the book reaches its funding target by Christmas, it’ll be distributed into bookshops through Penguin Random House, and you’ll have the satisfaction of knowing that you were one of the people who helped make it all happen. Big Up Words are going to publish a series of blogs where writers talk about their publishing journeys. Damon L. Wake’s book 10 Little Astronauts is going to be published by Unbound. I think there’s a moment in any academic project when you question everything you’ve done so far. For me, that moment came when I was sitting in a café with someone on the same Creative Writing MA as me at the University of Winchester. She picked up my work, read a bit, and said “Huh. So you’re handing in Agatha Christie fanfiction in space?” That was the moment I realised that I was taking a massive, massive gamble with my entire course. It was the moment I considered binning the whole thing and starting again, and it was the moment I decided to press on regardless. Partly that was because I was confident that the setting did work with the story, partly because I didn’t have time to come up with anything else. Fortunately, in the end, it all went pretty well. As strange as it felt to submit a mash-up between And Then There Were None and Alien as a serious academic project, the novella was awarded a Distinction and, shortly afterwards, accepted for publication. But more on that later. The thing about space is that it works extraordinarily well as a setting for a mystery thriller. In space, no one can hear you scream. In zero gravity, no one can hear your footsteps either. The truly colossal distances involved in travelling between stars—far enough that an S.O.S sent at the speed of light will still take years to be heard—guarantee that nobody is coming to help. The hostility of the environment itself means that the characters must work together to survive, even as paranoia threatens to drive them apart and a large part of the inspiration behind Ten Little Astronauts. I’d thoroughly enjoyed ‘And Then There Were None’ but found it took a long time to get started. There’s a lot of scene-setting—several whole chapters—dedicated to explaining how the various characters came together and why they can’t escape after it becomes apparent that one of them is a serial killer. The tension only reaches its peak after a whole series of murders has whittled the cast down to just three or four. By shifting the setting of my novella to interstellar space, I managed to move the discovery of the first murder to the very first page. Having been woken from suspended animation, chosen from a crew of thousands to respond to, a fire on board the ship, none of the ten astronauts knows any of the others. However, having discovered the body of an eleventh person at the scene of the incident—an incident that has also disabled the ship’s computer—they know that one of their numbers is an imposter who intends to kill them all. With no life support, and the masses of frozen crewmembers causing the air temperature to plummet, the ten astronauts have to split up to repair the damage despite knowing that anyone, in any group, could be the murderer. Having sunk an enormous amount of time and effort into Ten Little Astronauts for my course, and since it had been well-received academically, I decided to submit it to Scott Pack—an editor at Unbound—as part of a one-to-one meeting at the Winchester Writers’ Festival this summer. He passed on my manuscript, and within a couple of weeks, I got an email back saying that they had decided to launch the book! Unbound are a crowdfunding publisher—pre-orders from readers are what fund the initial run of first editions, with trade paperbacks distributed to bookshops by Penguin Random House after that—and they set me up with a video for the book. 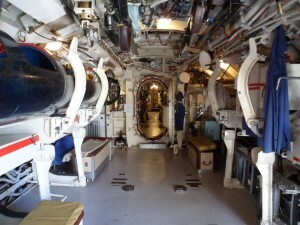 They let me pick the location, and since I’d done a good chunk of my research for it on board HMS Alliance at the Royal Navy Submarine Museum, I got in touch with the museum staff to see if they’d be happy for us to film on board. Visiting the submarine while writing had helped me pin down the atmosphere of the spacecraft in the book, so I was thrilled when they agreed to let us shoot the video itself inside. HMS Alliance background to Damon’s Unbound video. Since the crowdfunding campaign started, I’ve been doing everything I can to get the word out about the book. I’m hardly a big-name author, so the biggest challenge by far is letting people know it exists. 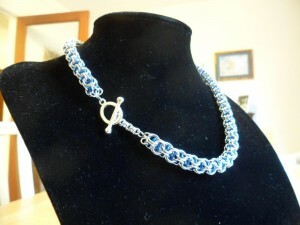 Unbound recommended offering attractive rewards for supporters of the book, and because I’ve been making and selling chainmail jewellery for a few years now, I’ve been offering one reward option that includes a necklace. The necklace is made of anodised aluminium—the same material as the International Space Station—which I think helps keep it relevant to the sci-fi story even though the technique is a thousand years old! I take the necklaces themselves to craft fairs, which makes for a natural conversation-starter when it comes to the book. If you’d like to read some of Ten Little Astronauts now, you can find a sample over on Unbound’s website. And if it sounds like a book you’d enjoy, please consider putting in a pledge: as well as getting a copy for yourself, your name will appear in the back of every edition to show that you were one of the great people who helped make it happen. It doesn’t matter if you finish and it doesn’t matter if you’ve never written before. Beth Hanson has founded Hampshire Scribblers to help you reach your goal. 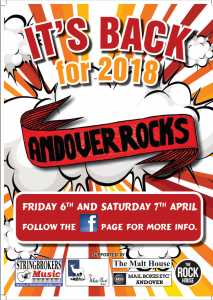 On October 17th at Andover Library between 2 and 3.30 Beth and our chair Cat Randle will be holding a workshop on how to get ready to write your 50K words. Practical advice, fun games and demonstrations on how to register. All for free. 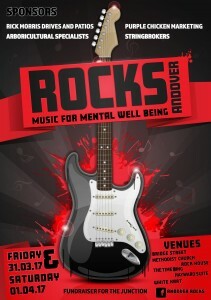 So come along and find out what its all about…. Some of you may have heard of National Novel Writing Month (NaNoWriMo) but for those of you that haven’t, here’s the low down. 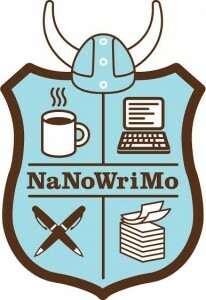 NaNoWriMo is a fun, seat-of-your-pants approach to creative writing! Writers begin on November 1st and work towards the incredible goal of writing a 50,000 word novel by 11.59pm on November 30th. October 17th – Planning or Pantsing what will I write about? All ages are welcome! Beth Hanson is now Hamshire’s ML. Our job is to prove we’ve got enough keen novelist to create Hampshire as its own part of the Nanowrimo verse. So Big Up Words will be helping Beth run fun FREE workshops in Andover library over from October 17th until December 5th. We’ll also be fundraising, our goal is £1,500 via sponsored writers and business sponsorship. How can you help? Grab a sponsor and write a novel, help us fund raise or come along and help us help the novelist reach their goals. Gavin Ketchen, editor of Burbage News, invited us along to a Saturday Market. 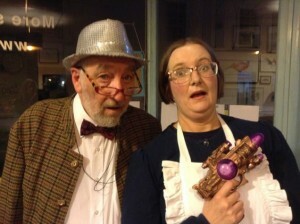 All month the good folk of Burbage have been donating money from their activities as part of the ‘Burbage Super Month’. The aim is to raise £1000 for Prospect Hospice. We said “Yes!” and teamed up with local Burbage author Barbara Townsend, and will be selling her wonderful books, ‘The Savernake Big Belly Oak’, ‘The Oaks of Savernake and the Lengendary Ghosts’, and ‘Harriet’ for a discounted price of £6.00, on the day. She is donating £2.00 of every book sold to the hospice. It will be nice to have another children’s book next to Ken Towells The Adventures of Anthony Ant. We’ll also be having our popular book tomola. People like taking a punt on finding a book they’ve never read before. If you are thinking of going to Malborough Jazz festival, pop in, have a cuppa at the vintage tea room and say hi to us at our stall. 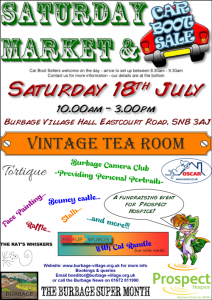 All the fun to be had at Burbage this summer.